Today, as we battle to balance and prioritise a multitude of tasks, it is all too tempting to indulge in a world of pixels and perceived perfection. The internet, while seemingly a harmless escape from the overwhelming complexity of twenty-first-century life, can numb us to the real world and make us oblivious to the weight of its histories. Recognising this modern-day aliment, Nicola Dale delves into the past, questioning the authority of symbolism by revisiting an intriguing historical character. Saint Jerome is best known for translating a large portion of the Bible into Latin, making it widely accessible for his and future generations. For this and other feats (he is said to have tamed a lion by removing a thorn from its paw), Jerome became synonymous with intelligence, modern language and intense piety. Consequently, he was canonised by the Christian Church as the patron saint of libraries. As the role of the library, and the languages it contains, continues to evolve and diversify, Saint Jerome’s significance seems all but lost — a distant figure disconnected from our fast-paced lives. However, with the opening of Leeds Arts University’s new library and gallery, we find Jerome again, here in a new guise. Nicole Dale: Figurehead. Installation photo: Nat Wood. Renaissance portraits of Jerome, first encountered during her recent investigative pilgrimage to Rome. Rather than swiping through images on the internet, the artist wanted to experience the sublimity of the original environment, and perhaps access the true essence of the Saint by observing intricate brush strokes and overwhelming scales. The diversity of Jerome’s appearance and persona are subtly altered between each rendition, revealing signs of autonomy, agenda and individual style. 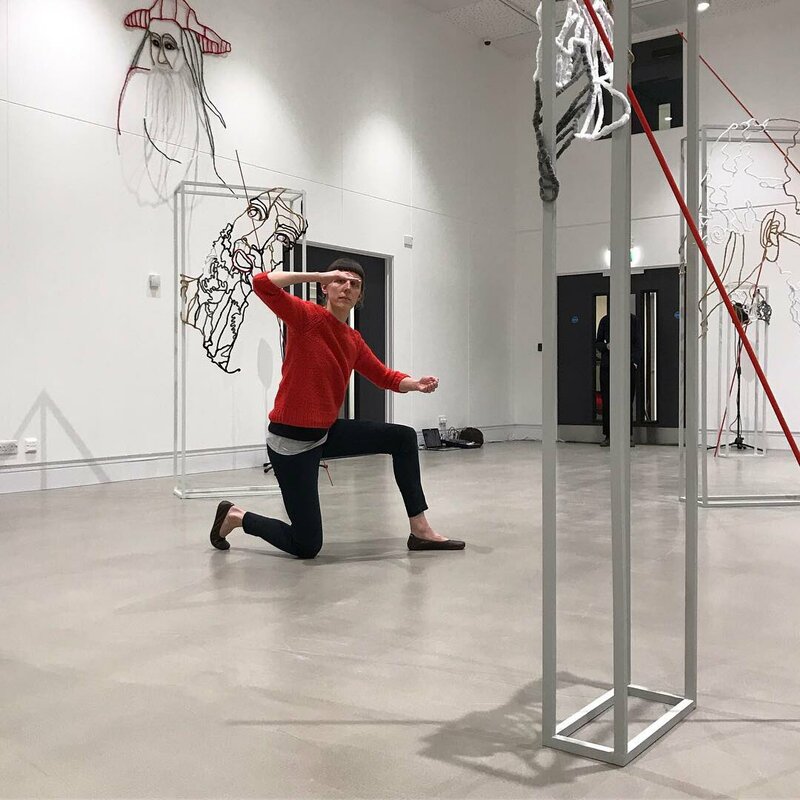 For the exhibition, the minimalist white gallery space at Leeds Arts University is punctuated by eleven cuboid armatures, each with a floating ‘head’. Each frame faces a different corner of the gallery, facilitating new perspectives and conversations as Dale’s Saints simultaneously encounter one another (in a way their originals never will), and viewers moving through the space. The soft lines of their faces contrast with the rigidity of the upright frames, their dimensions reminiscent of scaled-up mobile phone screens. In this way, they evoke a chronology of portraiture from Renaissance drawings to selfies. This comparison is reinforced by Dale’s decision to enlarge or exaggerate certain aspects of Jerome’s attributes, such as the spiralling halo found on the sculpture ‘Lippi’. Although the subject of each sculpture is taken from a pre-existing painting or fresco of Jerome and named after the original artists (male in every case), Dale’s process of cropping and adapting them to three-dimensional frames creates eleven unique interpretations. This demonstrates the Saint’s symbolic versatility, his appearance and attributes changing according to each interpretation. Jerome’s rise to sainthood has contemporary parallels with social media, his persona and popularity fostered through a process of constructing, filtering and idealising. Here, Dale’s sculptures not only evoke the past, but also demonstrate how a lineage of reconstructed images can give fresh relevance to a historical figure. The sketch-like sculptures are devoid of volume, shading or tone. This emptiness might be read as a critique of our contemporary dependence on the internet. As we swipe through vast amounts of information on a daily basis, much of it is quickly forgotten or disregarded. The spatial void of each sculpture not only hints at this practice, but also how digital images are formed. Millions of tiny pixels give the impression of line, colour and form, but the material essence of the picture is absent. Their minimalist nature asks us to look beyond the obvious; their sparse placement offering an illusion of connectivity. Depending on a viewer’s position, the sculptures can overlap and bleed into one another, creating further, messier portraits of Jerome. This underlines the importance of active sight and shows how the surface of an image can be misleading. The theme of distorted sight continues to dominate Figurehead as Dale explores the physical act of looking. Across the thirteen representations, the shape of Jerome’s eyes varies greatly. Some are big and wide, suggesting enchantment or wonder, whereas others are squinted and downcast in a state of deep concentration. To further emphasise these differences, lengths of bright red doweling are pierced through one eye on each of the standing pieces, adding a secondary structural layer and further enhancing their sculptural quality. 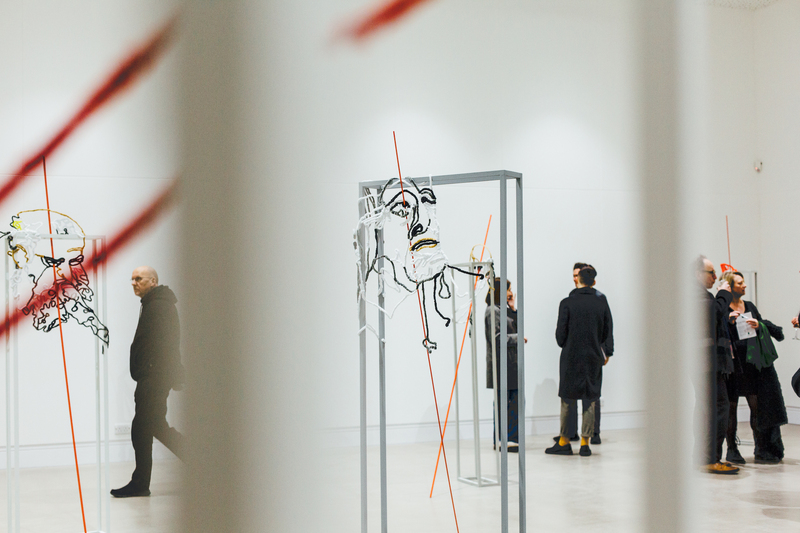 The stems work to plasticise their gazes, encouraging viewers to follow each line of sight and consequently notice areas of the gallery which might otherwise be ignored. This provokes thoughtful connections between Figurehead and the wider gallery and library, thus bringing Saint Jerome into the present. The acrylic red poles also point to an iconographical trope of male Saints in scarlet robes, and to the presence of blood. The placement of each pole required the metaphorical piercing of Jerome’s retina, a kind of attack on the religious canon and patriarchal symbolism that surrounds the figure. However, the vibrant colour and powerful focus of each line also conveys the power of Jerome’s gaze. Here Dale recognises both the male-centred history of her source material and her own agency as a woman making art in the twenty-first-century. 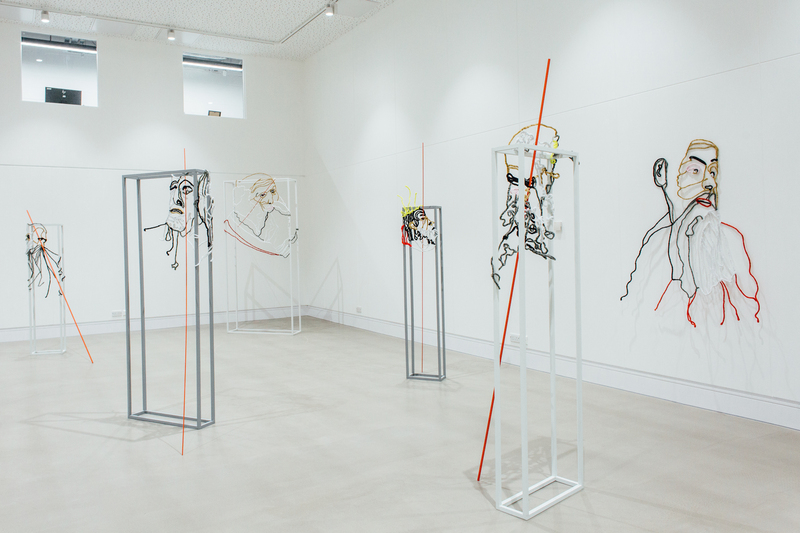 The red lines also have a likeness to descriptive marks used within anatomy drawings, but instead of sitting neatly within Jerome’s head (or mind’s eye), the glance is left floating in mid-air, beyond the sculpture’s frame. This prompts viewers to question where sight originates, and perhaps how present-day technology influences our vision, viewing patterns and attention spans. Viewers are invited to weave around the exhibition in a fortuitous sequence, focusing on both faces and escaping gazes, simulating a distracted form of viewing. Conversely, the disruptive nature of Jerome’s escaping stare forces viewers to stop and actively look at each portrait. This has parallels with the act of thoughtful observation Dale performed when seeking out and viewing paintings in Rome. Here, viewers utilise Jerome’s gaze to view new spaces for the first time. In a similar way, Dale utilises medieval iconography to assist contemporary sight and reflect on current concerns. The trope of distracted viewing is also identifiable within Dale’s source material, particularly through the repeated depiction of Jerome in a twisted pose. After viewing around ninety-five classical depictions, Dale noticed how his figure was often contorted as the Saint was torn between two pressing tasks, dividing his attention. Jusepe de Ribera’s ‘Saint Jerome and the Trumpet of Doom’ (1637) depicts him in a moment of shock as a loud noise interrupts the scene. Previously engaged in the thoughtful act of writing, indicated by an unravelled scroll at the bottom of the painting and a feathered quill held in his raised right hand, Jerome now twists to hear the blast of a horn. By picking up on this subtle trope, Dale’s portraits show how even the most glorified souls are susceptible to distraction. Similarly, Domenico Ghirlandaio’s fresco, ‘Saint Jerome in his Study’ (1480), outlines the virtues of the figure whilst depicting a loss of concentration or direction. Enclosed in a cramped, crowded room, Jerome sits at his desk, attempting to write. The scripture is not legible, however the Saint is probably in the midst of translation. With his right hand busy writing, the other supports his heavy head, suggesting frustration or fatigue. Moreover, he is twisted, his lower body and head positioned away from the desk, his gaze extending beyond the frame of the study and composition. While it is unclear whether Jerome is lost in thought or focused on something beyond the image (perhaps the intruding contemporary viewer? ), the scene is once again interrupted by a distraction. Dale’s ‘Ribera’ and ‘Ghirlandaio’ embody the same awkwardness, but without narrative, leaving the viewers to ponder the figures’ strange angles. With this ambiguity, the artist’s choice of materials is ever more important in conveying the physical contortion caused by distracted sight. She uses different colours and lengths of chenille stems to construct each face, selecting shades that correspond with the original images. By wrapping each stem around a skeleton of wavy wire lines, the artist not only injects colour and texture to the otherwise monotone frames, but also replicates the tell-tale twist on a small scale. Furthermore, the French noun ‘chenille’ translates as ‘caterpillar’, presenting another similarity between the Renaissance paintings and their contemporary interpretations. A chronology of Saint Jerome’s appearance becomes apparent through Dale’s series, questioning why certain characteristics, both physical and psychological, are associated with a nominal leader or figurehead. Symbolic images were pivotal to the Church’s interaction with its followers, especially when illiteracy was prevalent amongst parishioners. Letters and words such as ‘library’ and ‘language’ were attached to figures such as Saint Jerome, and featured within religious depictions of narratives or parables, thus reminding followers of the virtues they represent. Figurehead reveals how new agendas and authorship can prompt new metamorphoses of Saints. The artist’s choice of material not only emphasises the twist (evident in both the depictions of Jerome and our contemporary modes of distraction), but also implies that, like a caterpillar, the Saint’s appearance is continuously morphing in order to suit the ideals of artists, commissioners or societies — predominately all male-centred. Although there is some resistance to the policies and actions of leaders and their figureheads, many continue to acquiesce and ultimately fall in line with their rhetoric. Ultimately, Figurehead questions the origins of symbolism and queries whether emblematic figures can still have significance in a Western, post-technological context. Dale’s decision to transport Saint Jerome into the physical surroundings of a university gallery and library also asks important questions about the dangers of passive looking and skewed or distracted attention. The series correspondingly highlights why certain characteristics have been associated with Jerome, and how over time, different interpretations have altered his symbolism. Although our popular understanding of Jerome is dominated by his celebrated virtues, reinforced by symbols of lions and scrolls, some of his work has misogynistic and obsessive overtones (at least by current standards), such as his instructions to women for how to live piously. Dale’s linear faces consistently show Jerome with a grey beard and startling eyes, pervasive attributes that nonetheless leave us with the question: does the image of an old white man, who was ultimately an anchorite, still suffice as the symbol of libraries? Instead, his distracted looking and penchant for multitasking seems more relevant to our contemporary times. Perhaps instead of re-electing a new Patron Saint of Libraries, we should log off and take a long, focused, thoughtful look around us. 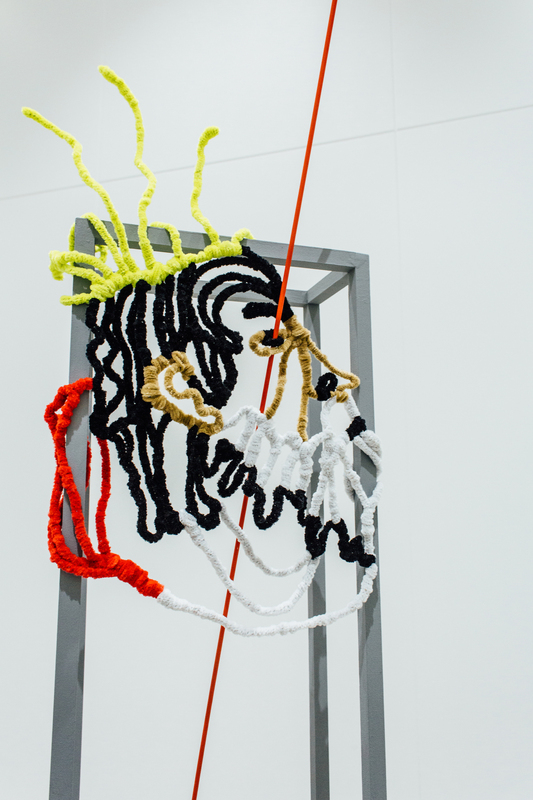 Nicola Dale performance, Figurehead, 2019. Photo: Kerry Harker. Saffron Ward is a recent History of Art graduate from the University of Leeds and Corridor8’s latest writer-in-residence. 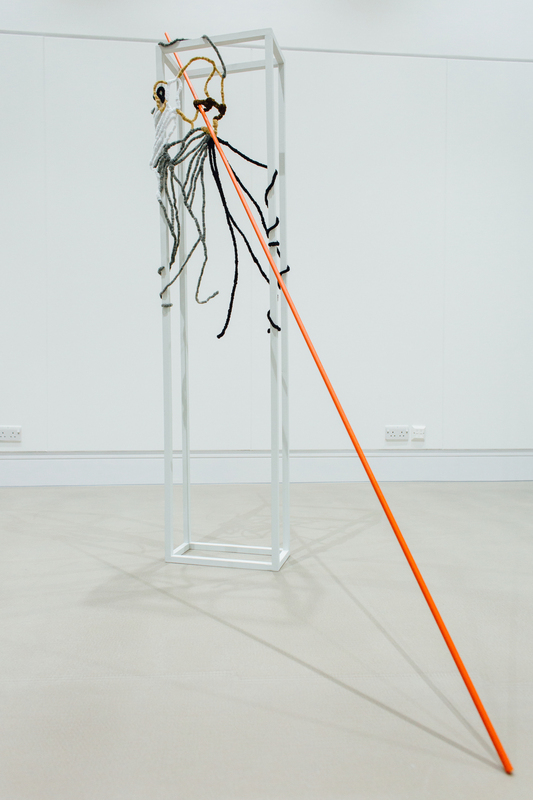 Nicola Dale: Figurehead ran from 9 January – 31 January 2019, with the closing performance and publication launch on the final day. To order a free copy of the Corridor8/Leeds Arts University residency publication, including an additional essay by art historian Sara Riccardi and a handmade insert by Nicola Dale, email catriona.mcara@leeds-art.ac.uk.